2017 may not be that bad after all...,,,..
Last edited by Heisenberg; 10-18-2016 at 11:19 AM. xvsfsl;gkl;fvxcvmx mm,.vm,./sdfd vx./ xc v ,dv,.cv!!!!!!!!!!!! The only minor thing I want changed is a "super" kick option for players who just kept on sending me posse invites. Like after 3 attempts and you reject them all, you can boot them. LEAVE ME ALONE! I BOUNTY HUNT SOLO! I will shot you in the head boy! I remember one time I was on with roxer, I tjink maybe alvarado, and a couple other guys. We saw another player coming, so we lined up and rode toward him like you see the posses walking through town in the movies. Guy rides by us saying "whoa guys, I don't want any trouble." lol yeah I remember that...I think our response was "we're just picking flowers"
Pretty sure somebody tried to pull a gun on us. Continue with Jack? or is this going to be a prequel? Rumors have been that it's a prequel. Couldn't see it being a sequel anyway, since the first took place during the last days of the wild west. i'd love for another john marston run. the voice, the character, it made the game for me. Well, uh, that was something. Oh yeah, Sony has timed exclusive DLC on this too. Really hope we're not playing as Marston again. I really liked him, but we know his story and his fate at this point. Playing as him just wouldn't hold any weight in my opinion. Personally I'd like to see us either playing as a new recruit to the gang with Marston as a side character, or as a lawman/bounty hunter who's pursuing the gang. I can't even imagine the scale on this. I haven't been everywhere in GTAV yet. Another thing of note is the game is now confirmed as a prequel to the original, with the mention of “Van der Linde gang." Dutch himself even makes an appearance at 1:15 in the new trailer. 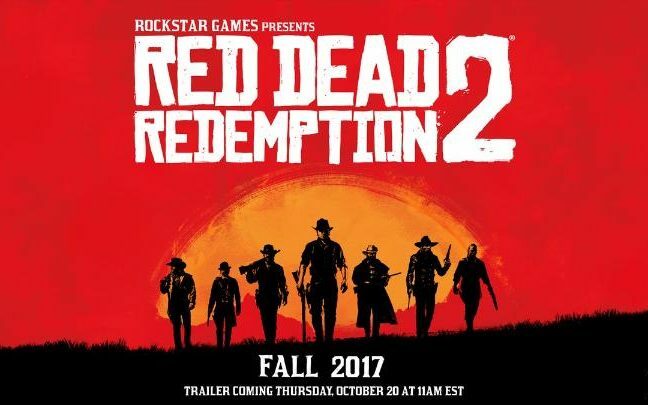 On top of already confirmed things such as dual wielding revolvers and canoes, notably a bow can be seen being used in the new trailer as well. What can't these people do. Don't think I have ever been as hyped for game. Absolutely loved the first one and was so gutted at ending. Had to be that way of course, but what a great character. What if he actually does mean Red Dead Revolver? According to my Rockstar Propaganda e-mail, October 26th, 2018. Berg' all this means is that we'll have more time to buy the most expensive yacht before Red Dead 2 comes out. Lots of rumored leaks recently for the game. The purported leak features a slew of online modes and features for the open-world adventure, including reports of the currently highly-fashionable Battle Royale mode, a team-based shootout known as Fight and Revive, and the Money Grab, which sees players racing against each other to bag stacks of gold, returning to their base and amassing a fortune as quickly as possible. The notes also speak of a huge online world, like the previous title, where players can roam at will. There is a bigger emphasis on the world having "life", including businesses setting out and packing away their storefronts as dawn rises and night-time falls. This world will be filled with tasks to be completed and activities to while away the hours, such as fishing and gold-mining. Players will hunker down in customisable tents, RDR2's equivalent of GTA Online's apartments. Home on the Range, and all that. The solo campaign will feature new vehicles such as mine-carts and horse-drawn carriages, and will feature all-new side-activities such as cattle herding, horsemanship and weapon proficiency challenges. A companion app will allow players to socialise and throw down with a round of poker. Also rumored to include a First-Person mode similar to GTA V's mode. So long as I don't receive posse requests every 30 seconds in multiplayer like in the first Red Dead Redemption, I'm happy. Hope that the multiplayer has a flying horse that shoots rockets. Would be a zombie wouldn't he? Figured I'd give this a bump since we're about a month out from launch. Information has been coming out at good clip these days. All the locations in the world, 250 species of animals and 19 horse breeds, all the gang members revealed, online won't be live at launch. What, no. The game is a prequel to the previous game where you play as an entirely different guy in 1899. Game's currently rumored to need around 105 GB of free space in order to be playable. If that's how much free space is needed after the install completes, it begs the question as to how large the download will be. Guess I'll hope and pray I'll have the space...got 240/500GB available. Probably a lot larger since that likely is not including the Day 1 patch. Should be a lot more manageable for the physical version depending on how the split goes or if they go a multi-disc route.